Samsung Gear S3 Manual - The Gear S3 from Samsung says ready for anything From work to weekend adventures, the new Gear S3 is designed to do everything you do. 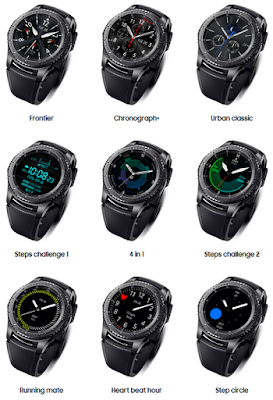 Read here Gear S3 Classic Manual and Gear S3 Frontier Manual to customize the Gear S3 settings for functions and apps. You can make your Gear more personalized by configuring various setting options. Download Gear S3 Manual PDF to your devices. The Gear S3 has the aesthetics of a truly premium watch with advanced features built right into the watch design. That's why it's so easy and effortless to use the Gear S3. It's also built for you to go days without needing your phone or to recharge. You get to feel free with the Gear S3. The Bluetooth model requires Wi-Fi connection and a voice call app for phone-free calls. The Gear S3 Frontier features an SOS mode that allows users to activate location tracking to alert families, friends and emergency services if the wearer encounters any problems, even when they don't have their smartphone on them. The Gear S3 Frontier also features an SOS mode that allows users to activate location tracking to alert families, friends and emergency services if the wearer encounters any problems, even when they don't have their smartphone on them. Looks and feels natural on your wrist and when you use it. Like a traditional watch. Only much more capable. Built for a pioneering spirit, to take adventures as they come. The Gear S3 Classic aims for a more iconic appearance, with a size and weight (which is lighter than the Gear S3 Frontier) that aims to replicate the balance found in hand-crafted luxury watches. A forward-thinking choice that offers a touch of luxury. The Gear S3 sets you free from your phone in the most natural way. You only have to turn the bezel to respond to calls, to read messages, to go to that app you need. With the Gear S3, you can go for up to four days before putting it down for a charge. Its battery lasts that long. Battery life may vary depending on usage and settings. When the Gear S3 needs a charge, just set it down on its wireless charging dock. Just like that. And you don't even have to wait long, because it charges fast as well. 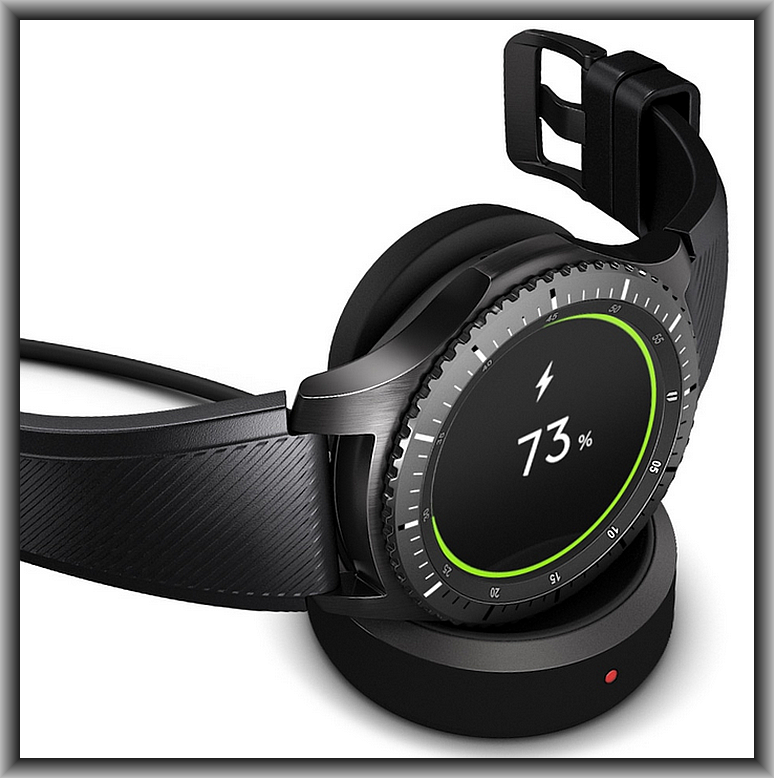 Gear S3 being charged wirelessly on wireless charger. Battery life may vary depending on usage and settings. Gear S3 battery set up available on 4 days. Wear the Gear S3 out in all kinds of weather, to all kinds of places. It's rated IP68 so it's able to withstand dust and dirt and being up to 1.5 meters or for up to 30 minutes underwater. With Gear S3, you don't always need your phone. You can take and make calls with its built-in speaker. You can also check voice messages and hear the alarms you set. 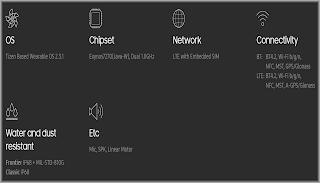 4G LTE standalone connectivity only available on Samsung Gear S3 frontier version, a companion for compatible Android smartphones, sold separately. 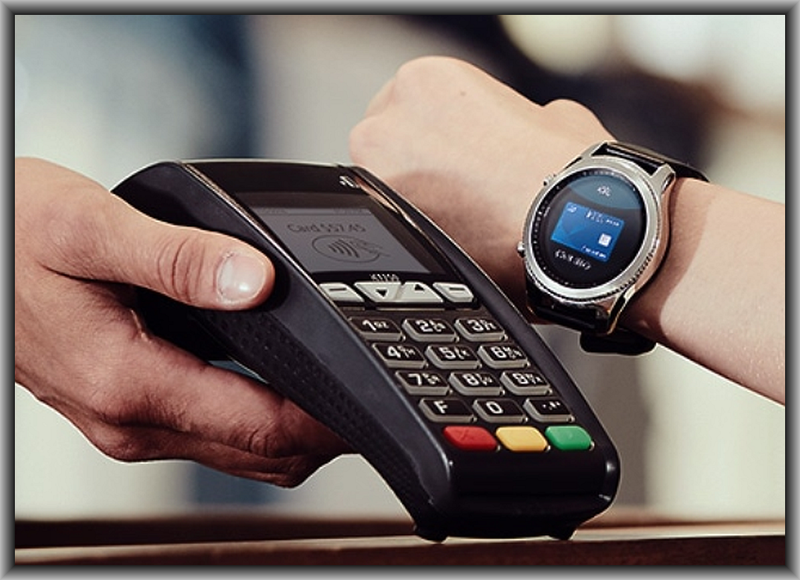 Standalone connectivity requires initial pairing of Gear S3 frontier with compatible phone and separate qualifying wireless plan. Standalone functionality limited if paired phone is not powered on or connected to a wireless network. Network coverage not available everywhere. Consult carrier for details. Make up to five payments on your Gear S3 without a Galaxy smartphone nearby after initial setup. Reload payment capability by connecting to a Galaxy smartphone via Bluetooth. Only compatible with select cards, carriers and Samsung devices; see the Samsung Pay Support page for compatibility information. IP68 rating means it’s water-resistant in up to five feet of water for up to 30 minutes; rinse residue/dry after wet. See user manual. Gear S3 is a companion device for compatible Android smartphones, sold separately. 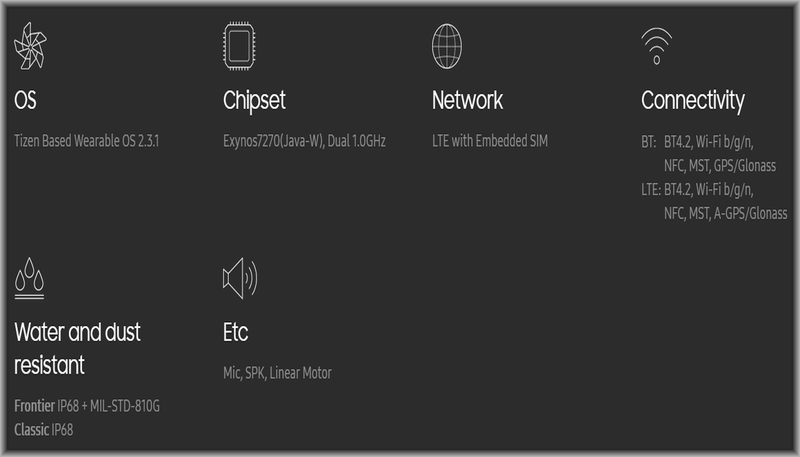 Full functionality via Bluetooth connection requires paired phone to be connected to a wireless network. Just press the home button three times. You can immediately send your location to predetermined people of your choice who will then be able to track your whereabouts in real time. The Service is provided by the Glympse location platform. Available services may vary by country or region. SOS service available in South Korea, US and Canada. On the Apps screen of the smartphone, tap Samsung Gear > Settings > Send SOS messages, and then tap the switch to activate it. Follow the prompts to add primary contacts. To send help messages with audio recordings, tap the Attach audio recording switch to activate it. Some smartphones do not support this feature. On the Settings screen, tap Connections > NFC. NFC: Activate the NFC feature to link your Gear to your credit or debit card. Tap and pay: Set the default payment app for mobile payments. On the Settings screen, tap Connections > NFC and then tap the NFC switch to activate it. Touch the NFC antenna area at the top of the Gear’s touchscreen to the NFC card reader. To set the default payment app, open the settings screen and tap Connections > NFC > Tap and pay, and then select an app. You can add widgets to the Home screen. Widgets are small apps that offer limited functionality to provide information and convenient access. You can use the following widgets by default.